In preparing this new edition, Farokh Master has made more rational arrangement of the chapters. The examination and the introduction chapters have been completely re-written. Throughout the text, various observations have been included, with helpful references. Many new observations of the old remedies previously written and the new ones have been also added. Dr. Master was thrilled at the over-whelming response the first edition received by doctors and students in India and abroad. To many it has served and felt the needs of upcoming homeopaths by emphasizing on the role of proper history taking and systemic examination. It is through their feedback that the author was inspired to bring out another edition of this book. 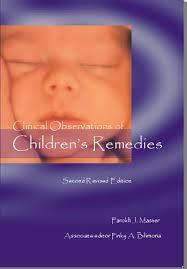 In years to come, this book will continue to give enthusiasm to upcoming homeopathic doctors and students to perceive the understanding of clinical observations in a pediatric patient with a human touch.